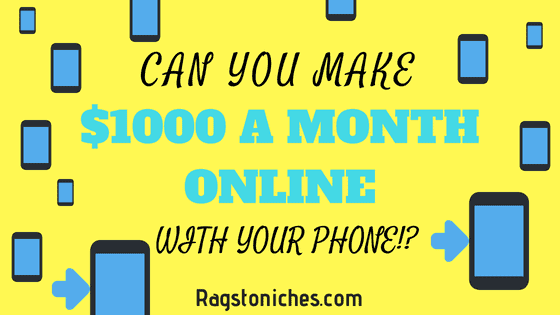 Make $1000 A Month Online With Your Phone: Is It Possible? Last updated on December 22, 2018 By Nat Leave a Comment This post may contain affiliate links. We appreciate you supporting Rags To Niches! Full disclosure here. 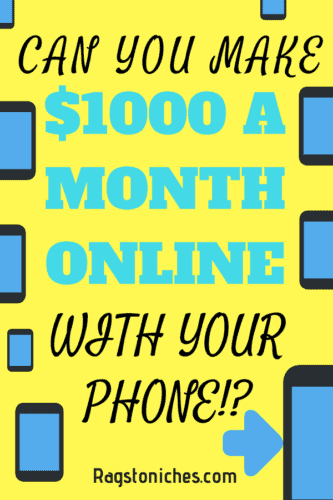 Can you really make $1000 a month online with your phone? Look, let me know if that’s a reality for you, but after reviewing hundreds of online opportunities, I’ve not heard of anyone seriously making thousands of dollars a month from apps, (unless you’re creating them yourself!!!). It’s not just because it’s completely beyond the realm of possibility, (although, it probably is). It’s because, most of the opportunities bloggers are mentioning are literally for pocket change …. $10-$20 a month or something if you dedicate a bit of time to it. If you work a lot on making sure you check in every day and do something, you can make more. Most don’t stick with these things for long though. Because online tasks are…. SOOOO boring most of the time. You wouldn’t be in your right mind to spend any TONNES time on most of these sites to make money. Doing certain social media tasks – such as *liking* a Facebook page, or sharing a post. Basically, a majority of these things are mundane tasks, for a very small amount of money. 1. Bloggers can make good money from promoting these sorts of offers, (if they are affiliates). 2. A large amount of people are actually interested in learning about these opportunities, (although, many are under the impression that they can earn more from it than they really can, OR are unaware of other ways that they can make much more online). Some Apps can be enjoyable and even fun in small doses. But they are not real serious income opportunities. I also get a commission for some things I recommend, (and even some things I don’t….You’d be surprised at how some people will still sign up for something, even after reading a negative review). But I still want to paint a realistic picture. I wouldn’t tell you that you can make a 1000 a month doing something, unless I genuinely felt it was a realistic possibility. I recommend these extra income sites… NOT because they will make you loads of money, (they wont, no app will at this point in time). But because they are some of the few I’ve actually enjoyed – DESPITE the low income potential. As of right now, there isn’t some magical way that you can make hundreds of dollars online, without putting in some considerable work. So, Can You Make Money With Your Phone? You can make a little extra money with your phone – doing activities like getting cashback on your shopping online, downloading other apps, playing games, entering sweepstakes, doing paid offers and more. You can also win money with your iphone, (if you’re a trivia genius, or just incredibly lucky… the odds are not in your favor!). Will you make thousands a MONTH doing it?! No way! I will list below some useful blog posts that I have found, (or written myself!) that will introduce you some apps you could check out and these are a combination of apps that can either make or save you some money. I’m always on the look out for new apps that can make or save me money. However, many of them don’t seem to last, or have various issues. As apps are becoming more and more popular and sophisticated; I’m confident that ONE DAY there will be apps that can bring you in a far more substantial income. With technology evolving all the time, what will be next!?! What will be the next big thing that everyone will be talking about as the NEW way to make money online. Several years back, it was kindle publishing. Then in the last couple of years, Merch By Amazon exploded on to the scene, (a platform where you can design/sell tshirts and have them printed and shipped for you) and that became one of the next big things. Could there be a legit mobile app that gives people real income opportunities in the future? who knows. But as of right now… the best we can find are apps where we can save a little & make a little. Making MORE Online – How Do You Do It? There are so many routes into making money online. From freelancing work of so many kinds, designing, blogging, e-commerce, e-books, creating online courses and much more. I built my very first website in 2015 and made some sales via affiliate marketing– (where you recommend products and services and earn a commission when a sale is made). Right now, I ultimately make the most online from having a blog online. There are many ways to make money from a blog – and you can create different income streams. It’s also something that grows over time, giving you the opportunity to make truly passive income. That means, that something you could have written several years ago, could still make you money long into the future – with no extra work. For example; I have posts that wrote when I first started this blog, that still bring in a steady flow of visitors and aside from the odd edit now and then, (if that). I have another blog I’ve barely touched in a year and that still brings in some affiliate commissions. It does take a lot of time to get to that point though – you can’t just slap-up a couple of posts and hope to get thousands of visitors to your site. It takes a lot of time & effort to grow; but ultimately it’s worth it. Would you like to do the same? Start learning for free here. What do you think about Mobile Apps? Have you made money with Apps… If so, which ones? Let me know in the comments! 40+ Ways To Make Money Online. Make $100 A Day Online. 14 Ways To Make Money From A WordPress Blog.